The Pension Královský Vinohrad is situated in a quite quarter of Prague called Kralovske Vinohrady. 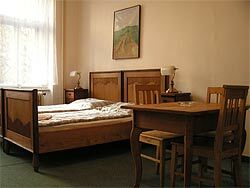 There are cosy rooms and apartments which are equipped with renovated antique furniture. Residence Královský Vinohrad offers comfortable accommodation in one of the central quarters of Prague, called Královské Vinohrady. The pension is placed in a former block of flats built in 1910 carrying certain historic architectural features. There are single, double, triple, quadruple rooms and 3 apartments for maximum 6 people (2 separate bedrooms) available. In each apartment there is minibar, TV + SAT, phone, bathroom with shower or small bath and toilet. One apartment has fully equipped kitchen. Please take into consideration that our house does not have a lift, because it is historical building. The reception is open during a day from 08:00 am till 08:00 pm all the year. Check in time is from 02:00 pm untill 08:00 pm, check out untill 10:30 am. In case of emergency it is possible to reach our assistant on a phone during night hours. Continental breakfast is served in our breakfast room from 08:00 am till 10:00 am. The price you can find in our price list includes that. 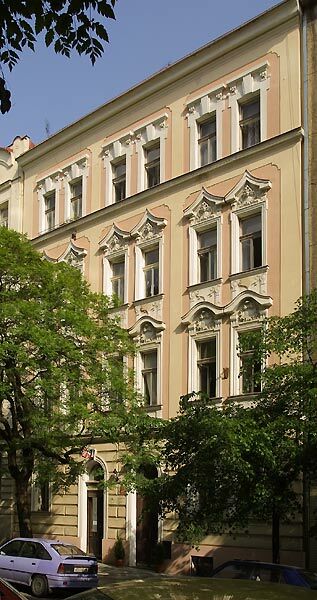 In the area of Kralovske Vinohrady there are many restaurants to have something to eat all the day, details you can discuss with our receptionist. Five minutes from our place you will find a tram stop with very good direction to the historical centre of Prague, to the National Theatre, the Prague Castle or to the funicular going to the Petřín Tower, so does the subway, which is 10 minutes far away. The pension is suitable for individuals, as well as groups and families with children. Rental possibility for longer period of time (for example 1 month, 1/2 of the year etc. ), please discuss with our staff. We can arrange theatre tickets, excursions and tours in Prague and in the Czech Republic, individual guides, car rental, secretarial services.